This is an interesting Yellow Eyed Zoanthid from deeper water that is most likely a color morph of Zoanthus pulchellus. 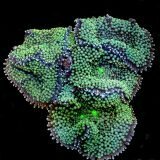 The body and oral disk of the polyp is a dark blue, to blue green color, and the mouth is bright lime green to yellow. There may be some variations in the color, but if the body is more brownish, we sell it as a brown with green mouth variety. 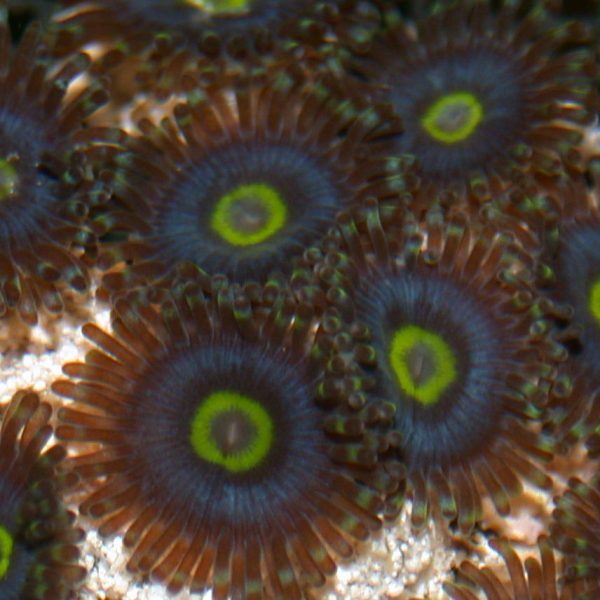 Yellow Eyed Zoanthids are partially photosynthetic and partially detritus feeders. Since this morph is from deeper water, in the wild it relies mainly on a daily shower of sediment and detritus, so you will need to regularly dust them with some sort of fine particle food to keep it in optimal health. If you look on ZoaId.com, the closest match to this color morph would be the Alien Eyes morph, but bear in mind that lighting conditions can make them look different in your tank and they can even change color over time as they adjust to the light in your system. We take these pictures in sunlight with a standard flash, so they are not jazzed up by some sort of funky lighting. This is what they actually look like in the wild, so that’ is about what they will look like when they leave our warehouse. We fresh water dip all of our zoos when they are brought into the warehouse, and regularly clean, prune, and groom them, but there is always a possibility that they might contain some unwanted hitch hikers, so additional treatment is recommended. Go to Reefcentral.com for more information on treating and dipping zoanthids. They also ship real well by priority mail, so this is a great way to try some different zoanthids. Nano: The polyps are small, about a half inch or less in diameter, and this nano cluster will contain at least 5 polyps, and maybe a few more than that. Small: The polyps are small, about a half inch or less in diameter, and this small cluster will contain at least 15 polyps, and maybe a few more than that. Large: The polyps are small, about a half inch or less in diameter, and this lg cluster will contain at least 30 polyps, and maybe a few more than that. 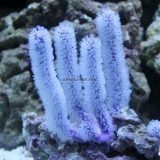 Care should be taken when handling any zoanthid, ricordea, mushroom coral, or sea anemone because they use stinging cells called nematocysts to sting and capture their food, and these cells can cause skin irritation and eye damage if it gets on you or in your eyes. The mucus of some of these animals also contains strong toxins that can cause severe skin irritations and permanent eye damage if handled improperly. 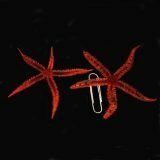 Use latex type gloves and protective glasses when handling or fragging these species. Ection and great customer service. The entire cluster opened within just a few hours of being in my system. Gorgeous blue/green with a bright yellow ring around the mouth. Very nice for the price! Not sure what the guy got who says they are grey. Mine are a deep brown/blue, with bright yellow rings around the mouth and green skirts. they grow fast and are very pretty. These are vary bright and colorfull! Probably the neatest looking zoos in my tank. Will order more soon!